Neale Richmond, a senator from Dublin, has pleaded with the government of Ireland to relax the laws for the non-EU nationals to get work permit of Irish. He wants to expand the lists of the occupations for which foreign workers are eligible. 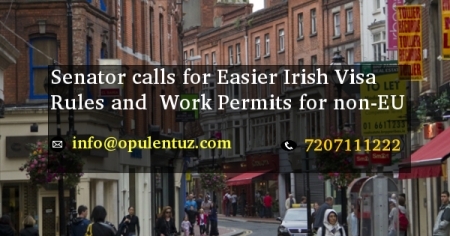 Irish Employment Permit and Visa scheme both are involved in UK Tier 2 visa and compared as the plan to make much more comfortable. The UK scheme is more expensive and complicated system this will consider as the alternative to the migrants for approaching the U.K.
Neale Richmond addressed the Minister for Business and Enterprise Frances. Fitzgerald & Mr. Richmond explained that presently, only skilled professionals are from outside of the EU the courses like Pharmaceutical Companies and International Finance, can be applied by eligible people under EU. Present list includes professionals like IT specialists, process automation or engineers working in chip design, medical practitioners, web designers, midwives, nurses and international marketing experts. The professionals excluded from the Ireland shortage of occupation list are Opticians, Welders, Secretaries, Electricians, Mechanics, Plumbers, Physiotherapists, Hospitality workers, Social Workers, Farmers, Carpenters, Plasterers, and Bricklayers. Among the various professions who disqualified from the list, are of high demand and staff shortage Mr. Richmond said. The profession list is restrictive, and regions experience the constant needs of the worker. Present lists focus on highly and skilled & well-paid occupations which require filling up, but they're several low wage jobs that should be added to allow business fraternity to provide better service at reasonable rates. He also identified the noticeable gap in the place of work across the hospitality sectors. Employers are facing issue and difficulty in recruiting the trained chefs and experienced waiters. In the meantime, Richmond claimed that the staff is in short supply all through the Ireland like nursing, construction sector, farm workers and cleaning areas all over the Ireland. Due to dissimilar lack of book-keepers in Ireland, he also made suggestions. At the same time, Ireland immigration department is understood to be reviewing its shortage of occupation lists and the job roles for which Non-EU workers can apply for that. Irish Visas is increasing more and becoming famous. In the U.K. less number of people, obtain the qualification to remain indefinitely. Presently, The .. Government is taking steps to restrict Tier 2 visas. For Tier 2 It allows skilled workers to work for a Sponsoring License holder to gain permanent residence to U.K. Fill out a free evaluation form or contact us at [email protected] or call us 7207111222. One of our experts will meet your expectations and provide answers to queries.